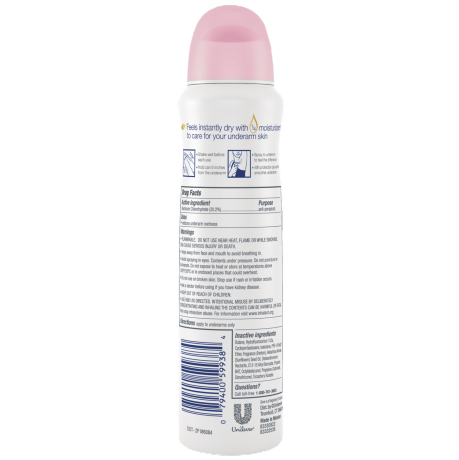 This antiperspirant deodorant goes on instantly dry, delivering up to 48-hour protection and underarm care in a gorgeous baby powder fragrance. Save time and start your day with a beautiful boost from Dove Dry Spray Antiperspirant Deodorant Powder Soft 3.8 oz. 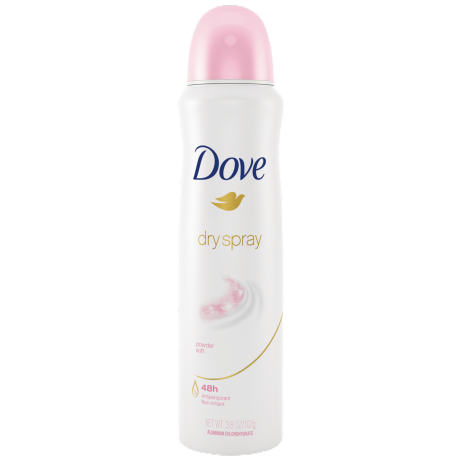 Part of the Dove Dry Spray range, this antiperspirant deodorant spray means you can get dressed instantly without the fear of wet patches on your clothes. As well as protecting against wetness, Dove Powder Soft also helps to keep sweat at bay for up to 48 hours, with a gorgeous baby powder scent. 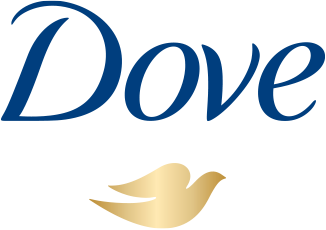 Blending Dove ¼ moisturizers with a dermatologically tested formula, this Dove Dry Spray provides great underarm care that is caring to underarm skin. In fact, it even helps delicate underarm skin to recover from the irritation that regular shaving can cause. Use this antiperspirant deodorant spray regularly and you can enjoy beautifully soft and smooth underarms that stay dry all day long. To use, apply Dove Powder Soft Antiperspirant Deodorant Dry Spray after bathing or showering, once your underarm skin is cool and dry. Spray each underarm with two or three short bursts from about 6 inches away. You can get dressed straight after application and enjoy the feeling of being dry and fresh all day long with Dove Dry Spray Antiperspirant Deodorant Powder Soft.